I finished my second piece on Wednesday!. So here are both pieces, with close-ups for both. I'm please with how they turned out, and I have so say they are definitely out of my normal comfort zone, which was my objective. Beautiful colour combinations, the copper work is gorgeous. Thank you, Sam. 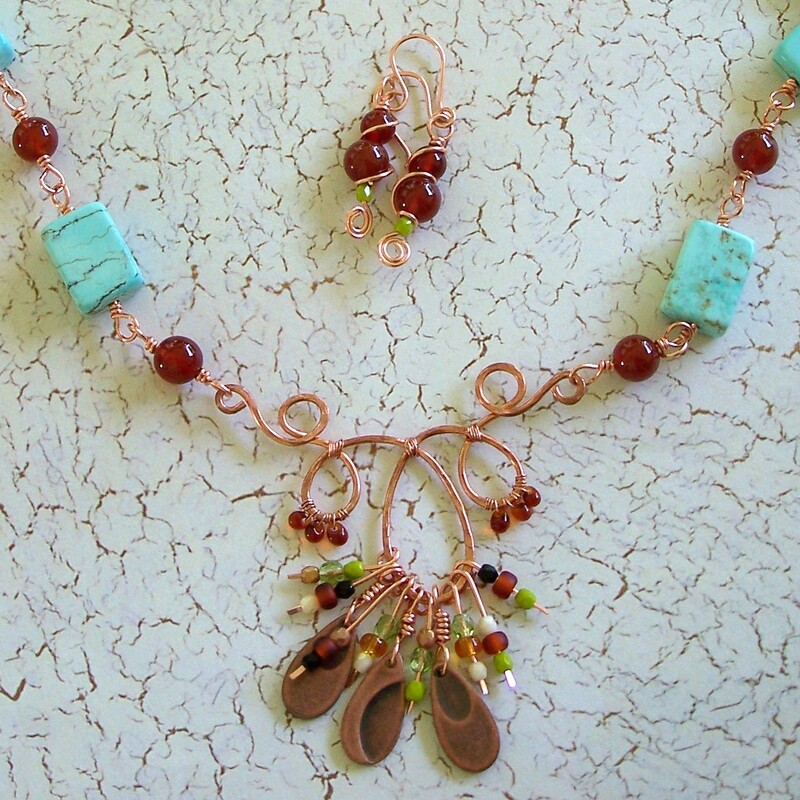 I love working with wire, and you can't go wrong with copper and any shade of blue or green! Very nice! Looks ..."organic" to me! Very nice pieces, and your beautiful wire work really highlights the beads nicely! Gorgeous! I am in awe of your skill with wire! Beautiful design work. Love the wire work. Love the color combinations! Nice work! Love your wire work on the focal points. Both pieces turned out great! I do like the first necklace, your wirework is lovely. Fun wire focals. I like how you used them. The gold and blue combination in the first necklace is a stand out! Absolutely gorgeous Carol! What you made with the components and beads is amazing! I like both of your pieces. Your wirework is wonderful. I love the first necklace, great color combo! Thank you, Liz. Comments like yours and others are inspiring and provide a lot of "fuel" to be creative. I joined the bead soup blog party to try to step out of my comfort zone, and it did just that. I will post more as I do them. Beautiful wirework - lovely designs!! I love the copper necklace. Your wire work is stunning. 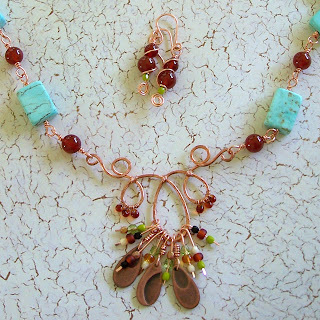 Great wirework and 2 beautiful necklaces. I especially like the blue and brass one. Your wirework is fabulous! It sets off the beads so beautifully. LOVE these pieces! Very pretty necklaces, great design! gosh... such pretty pieces...!!! i think you deserve a good pat on the back! for a job well done!! Gorgeous, stunning, brilliant...I love what you created. Ty for sharing your creativity and vision with us. I was in first reveal but have loved viewing all the reveals. I LOVE your creations! 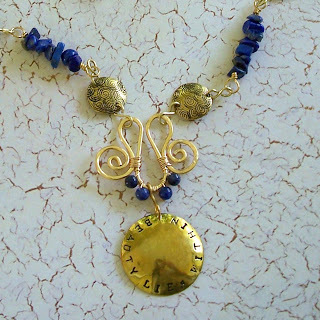 I love the wirework you did to create both bails of the necklaces. I love the colour combination you have chosen for your pieces too, especially the 2nd piece. 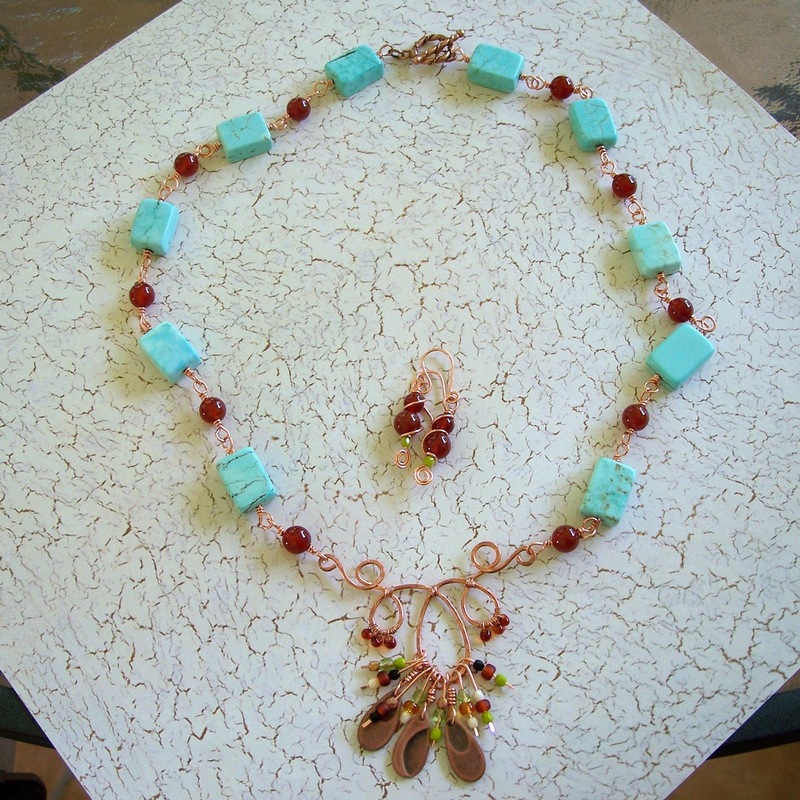 The adding of copper wire and red coordinating beads really made the 2nd necklace stand out. The focal you created for the 2nd necklace is so pretty. Beautiful pieces! 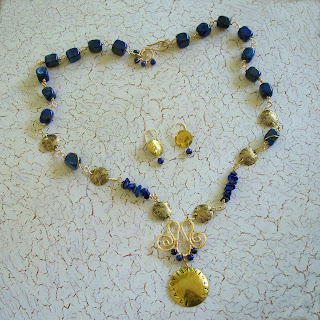 I really love the cobalt and gold necklace. Great job! I love your pieces. I really like the way you fancied up your focals with the wire work. Great job! Your pieces are creative and fun, love everything about them! Great wire work, so beatiful! Oh just lovely! That fabby wirework really makes both necklaces special. Out of your comfort zone or not, they're lovely! I especially like that second one with all of its cool dangles and brightness. Well done.